There are times in our life where we feel stuck. Our noble desires for a successful career and family life get bogged down or derailed by the challenges before us. Whether it be a difficult circumstance or our own limiting beliefs and fears, we can’t seem to get past what holds us back. 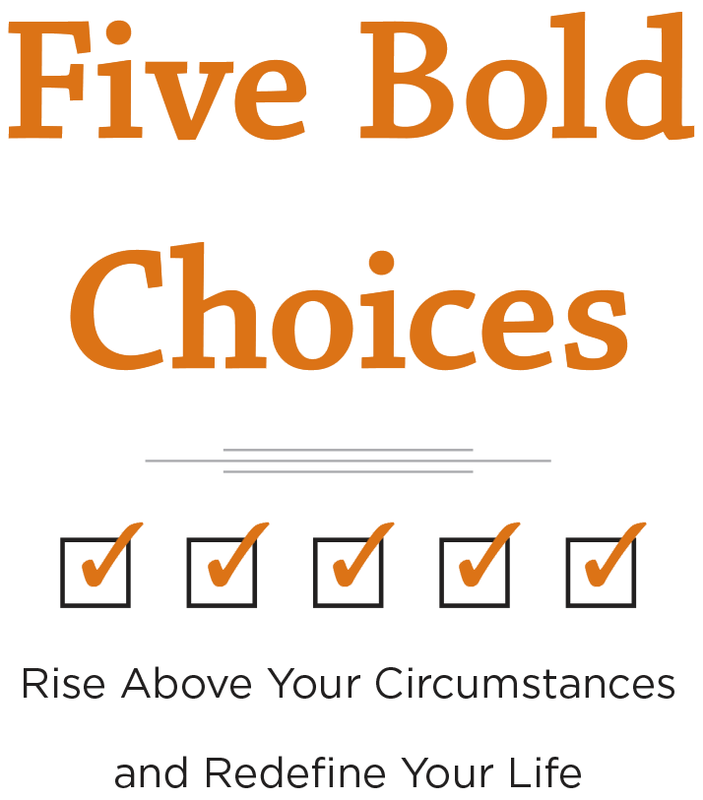 Five Bold Choices helps you break free from the barriers that prevent you from realizing your untapped potential. What if the very things you fear and avoid are the very portals of your success and significance as a leader at work and at home? No one seeks trials but they oftentimes put us on a pathway toward realizing our true purpose and potential. Jay Coughlan was confronted with a personal hell that started with making a terrible choice to drive home after drinking with his dad. This decision resulted in a horrific car crash that killed his dad. Jay provides a remarkable story of perseverance from convicted felon to successful CEO. 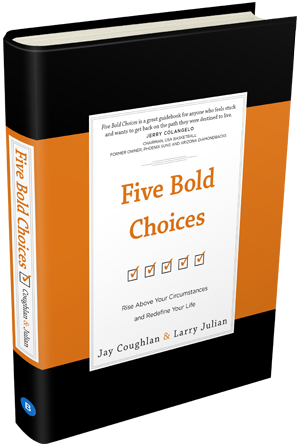 In this book, best-selling author Larry Julian and Jay Coughlan map out five bold choices that get you unstuck and enjoying the journey God intended. This book will not only inspire you to triumph over your most challenging issues, it will provide a practical plan to persevere and realize the true potential that lies within you. "This little gem is worth a quick read. You will come away with some solid ideas to make your personal and professional life better." "Drawing upon their own professional and personal experiences, Coughlin and Julian not only offer their insights and wisdom as to how one can navigate life’s storms with clarity and conviction, but do so while leading the reader on an intimate journey emerging from their own spiritual and personal renewal. Be forewarned, reading this book will not only cause one to reexamine and reassess their current status in life, professional or personal, but will provide scriptural principles necessary to pursue a life of influence rather than a life of affluence. Coughlin and Julian use various passages of scripture to drive home the strategic importance of being grounded and balanced, both spiritually and personally. I recommend this book to anyone who may be re-examining their standing in life or for the person who simply needs quiet reassurance that they are on the right path." "Any leader knows that Bold Choices are the thing that either brings growth or disaster. Making bold choices wisely is the key. Based on profound personal experiences, Jay and Larry spell out 5 fundamentals that we all need as leaders, family members and friends to make wise choices." 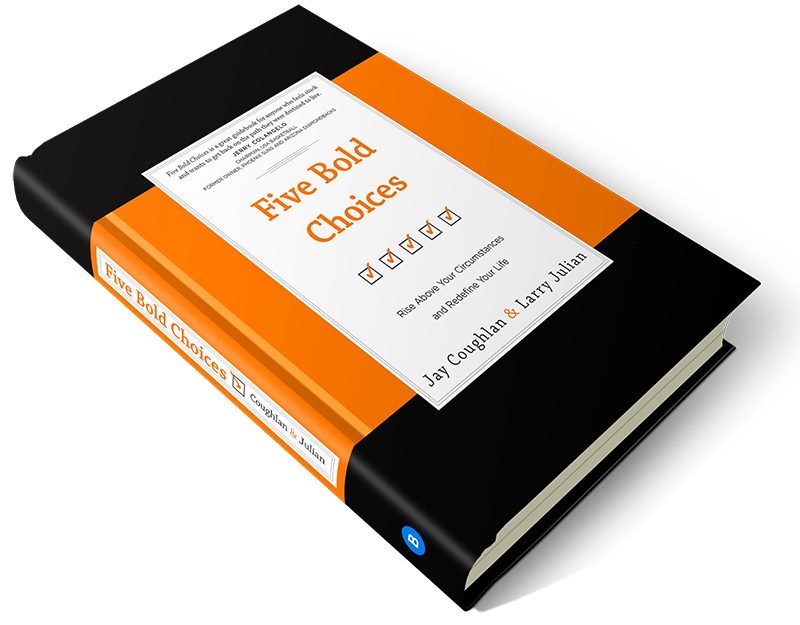 "Five Bold Choices blends Jay’s riveting personal story with decades of experience as Fortune 500 CEO. The result is a book that gives us the clarity and courage to make the bold choices that make the most out of life's greatest challenges. This book will shock (I don’t like the word shock. It sounds like the National Equirer. We need another word... embolden you, encourage you or motivate) you into action." National Geographic Fellow and three-time New York Times Bestselling author of the "Blue Zones: Lessons from the World’s Longest-lived People"
"Most leadership books train readers to share their successes and hide their failures. With stories of remarkable transparency, Five Bold Choices helps the reader see failure as not something to fear but an opportunity to grow." "Big decisions often change lives. This book will positively inspire you to consider bold choices that could transform your life -- and the lives of many others." "Adversity brings opportunity, and how we deal with it determines whether we enjoy the journey. This is a great guidebook for anyone who feels stuck and wants to get back on the path they were destined to live." To download a sample of Five Bold Choices, insert your email below. 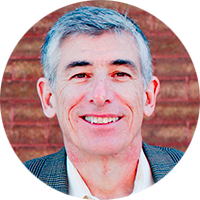 Jay Coughlan is a keynote speaker, mentor to aspiring business leaders, and an inspiring leader who fosters a culture of high-integrity and openness, having served as CEO of such industry leaders as Lawson Software and XRS Corporation. During his tenure as CEO of Lawson Software, the company completed a $200 million initial public offering (IPO), while growing revenue from $200 million to $430 million. Jay and his family make their home in Eden Prairie, Minnesota. 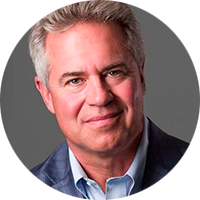 Larry Julian is a best-selling author, speaker, and executive coach who helps CEOs, entrepreneurs, and small business owners successfully lead with their faith and values. Larry’s work has been featured in The Wall Street Journal, Inc. Magazine, CNN.com, and Fortune. In addition to God Is My CEO, Larry’s business leadership books include God Is My Coach and God Is My Success. Larry and his family make their home in Minneapolis, Minnesota.